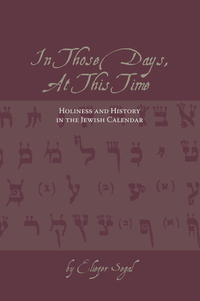 Written for a general audience, the essays collected here present refreshing and often humorous glimpses of various topics in Jewish history and traditional religious literature. Inspired by the diversity of Jewish thought, author and scholar Eliezer Segal sheds light on the social and political forces that have brought the Jewish community together in the past and still speak with familiarity to a modern western culture. Enlightening and entertaining, Professor Segal's writing is a rare blend of scholarship and wit, highlighting contemporary experiences that bring the rich heritage of Jewish civilization to life for the everyday reader. With an extensive and broad knowledge of ancient and medieval Jewish social and religious traditions, Segal deftly crafts anecdotes and explanations that address the tribulations of contemporary life. From topics as diverse as panhandling, tennis, vampires, and the history of the tomato to themes as universal as weddings, charity, and taxation, the essays presented here, some for the first time in English, all include detailed notes on sources for further reading. Equally suited to those after a light-hearted romp or those on a serious quest for knowledge, Ask Now of the Days that Are Past is sure to satisfy anyone who has ever wondered how the past still influences us today. Eliezer Segal was born in Montreal in 1950 and has published numerous articles and books on Jewish subjects. He is a professor at the University of Calgary in the Religious Studies department, where he has been teaching since 1986. 14. Who Was Rembrandt's Jewish Bride? 19. Buddy Can You Spare a Dime?